It all began with a kick of the ball. In 1877, when Calcutta was still capital of British India, 10-year-old Nagendra Prasad Sarbadhikari was mesmerised by a ball game being played by Europeans in the vast open grounds in the heart of the city. He descended from the carriage taking his mother to the riverfront and watched from the sidelines. At some point, when the ball rolled over to him, Nagendra Prasad picked it up and, on being encouraged by a European player, kicked it back to the playing arena. That, it is said — if apocryphally — was the first time an Indian kicked a football. The Indian, it so happened, was also a Bengali. Widely regarded as the father of Indian football, Nagendra Prasad went on to set up a string of football clubs in Calcutta. Gradually, a clutch of native Bengali clubs led or patronised by Nagendra Prasad – Boys Sporting, Friends, Presidency, Wellington and Sovabazar – began to challenge the British monopoly of the field. Then came the triumphs. Sovabazar Club opened the native account with a stunning 2-1 win over the East Surrey Regiment in the Trades Cup of 1892. A year later, Fort William Arsenal — a team made up of Indian workers — won the Coochbehar Cup. The feat would be repeated by Mohun Bagan club (established in 1889) in 1904 and 1905; in 1905, they would also win the Gladstone Cup. Between 1906 and 1908, Mohun Bagan would pull off a hattrick of victories at the British-instituted Trades Cup. The victories cemented the relationship of Bengalis with football, based on the belief that, on the field, the Bengalis could better the British. The stage was thus set for the ultimate assault. When Mohun Bagan lifted the IFA Shield in 1911 beating the all-British East Yorkshire Regiment in the final after overpowering four other British teams, the victory transformed football’s status in Kolkata, notes Boria Majumdar, sports scholar and author of Goalless: The Story of a Unique Footballing Nation, “from a relatively insignificant leisure pastime to an important cultural institution with redefined socio-political meanings”. For Indians of the era, there was no sporting moment more significant than Mohun Bagan’s 1911 triumph, especially as it played out in the backdrop of the 1905 partition of Bengal and the decision to move the capital from Calcutta to Delhi. “It galvanised Bengalis like never before and fuelled their nationalistic pride. Football was seen as a powerful tool against the British,” says former India football captain P.K. Banerjee. After Mohun Bagan’s 1911 IFA Shield victory – the centenary of which is being celebrated this year – football found a permanent space in the Bengali imagination, Banerjee adds. So it seems a bit of an overstatement when an East Bengal club official declares that “if one is a Bengali, one has to either support Mohun Bagan or East Bengal”. 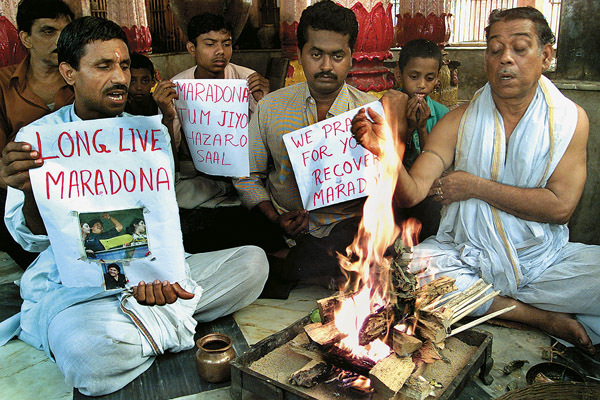 Banerjee isn’t alone in his pure devotion to the game; nor is it an anachronistic emotion. A day before a crucial I-League match between the two traditional Kolkata rivals, I bump into Sanjay Mazumdar at the East Bengal grounds. One of a handful of spectators for a Aryan-BNR local league match, Mazumdar has his eye on the ball and his heart with BNR. It is a team he once represented and in which he has invested his support for life. He knows (former Indian football stars) “Balaram and Appalaraju went on to play for the nation after representing BNR” but can’t remember when BNR last topped the Calcutta League or even came close. Yet, his support for BNR is unstinting and unconditional. Mazumdar played for two Kolkata clubs, Kalighat and BNR, before injuries forced him out. The Railways job never materialised; he now works for a kitchen appliances company. “But whenever possible, I come for BNR’s matches. I try to be as close to the field as possible,” Mazumdar says, his back to the mellow November sun and also, as he indicates, to the buildup to the Mohun Bagan - East Bengal clash the next day. Less than 200 metres away, a long queue snakes through the East Bengal club premises. Supporters have queued up for tickets for the next day’s derby, a match that officials reckon will fill the 1,20,000-capacity Yubabharati Krirangan in Kolkata. For a week-day encounter in 1997, the stadium packed in 1,31,000, many without tickets. FIFA, football’s global parent body, lists the match among the highest-attended club games in the world, beating similar club-level rivalries in Europe and Latin America. For more than a century, every political and social churning has found its reflection in football. If, in the early days, a wily combination of short passes, sharp bursts, crafty footwork and incisive shooting helped the barefoot Bengali to beat the British at their own game (leading a visiting captain of a British team to remark that only Indians play football, while Europeans played ‘bootball’), in the 1930s, it was associated with the nationalistic Bratachari movement founded by Gurusaday Dutt to promote spiritual and physical growth. Post-Independence, the game received a shot in the arm with the influx of Hindu refugees from erstwhile East Bengal. In the formative years of the Communist movement in the state, cadres found common — if covert — cause with the East Bengal team and their supporters. It helped, of course, that football has always been a game of the proletariat, requiring only a ball and a few players. In the best of sporting traditions, however, football unites Bengal much more than it divides the people along club or sectarian lines. Mohammedan Sporting, founded in 1891, for instance, represented the football ambitions of the city’s influential Muslim population. Fans of the Big Three — Mohun Bagan, East Bengal and Mohammedan Sporting — were known to clash, even violently, but none of these incidents ever led to wider ethnic or communal conflict. All three teams contributed players to the Bengal state team, which has won the inter-state Santosh Trophy 31 times out of 65. If football fosters its own mythology in Bengal, radio was its vehicle. Generations of Bengalis ‘saw’ the game through the strident voice of the late commentator Ajoy Bose describing the artistry of Krishanu De, the bicycle kick of Shyam Thapa, the rock-solid defence of Manoranjan Bhattacharya, the crafty headwork of Sisir Ghosh, the nifty tackles of Sukumar Samajpati, the unstoppable pace of ‘P.K.’ or the panache of ‘Chuni’. Perhaps inspired by that commentary, retired Dock Labour Board employee Pannalal Chatterjee and his wife Chaitali save their pension funds to be able to watch the football World Cup live every four years. They haven’t missed a single edition since Spain 1982. At the Mohun Bagan club, 75-year-old Krishna Kumar Mukherjee breaks down while displaying his father’s club membership card, dated 1937. Shiladitya Mitra, a Mohun Bagan fan half Mukherjee’s age, forgoes dinner like the older man whenever the team loses a big match. India may rank a lowly 162 (out of 204) in the FIFA charts, but the football mania in Bengal is not about numbers; it’s not even a matter of choice. It is a legacy. At the Kolkata Maidan — the vast open space that is also home to most of the city’s major football clubs — nostalgia is thrown about more as a javelin than a ball, its force often piercing opposing logic and reasoning. For every deed accomplished by Mohun Bagan in its 122-year history, an opposing feat, equally stirring, is cited by the 91-year-old East Bengal club. Though consensus between fans of the two clubs is rare, there is a hint of unanimity in acknowledging Mohun Bagan’s 1911 feat. There’s a catch, of course: East Bengal fans point out that eight of the 11 Mohun Bagan players of the 1911 team came from East Bengal, the eastern flank of Bengal which became East Pakistan in 1947 and Bangladesh in 1971. The unease is ancient, but matters came to a head and the East Bengal team was born in 1920 after a player from the region allegedly faced discrimination during a Mohun Bagan-Jorabagan match. Since then, the red-and-yellow of the East Bengal jersey has come to represent the hopes of a displaced population. Over 15 million Hindu refugees poured into West Bengal from the east after 1947. They found an emotional harness in the East Bengal team, bequeathing it their loyalty and lungpower. The ensuing competition between the plebian-supported East Bengal and Mohun Bagan, the team of choice for the wealthy landed aristocracy, is the sporting bedrock of the traditional Bangal-Ghoti divide, an ethnic cleavage at once charming and acrimonious, comic and offensive, virtuous and insolent, and unapologetically racist. While the refugee supporters of East Bengal club would be disparagingly called “Bangal”, they returned the favour with “Ghoti”, synonymous with Mohun Bagan. However, even slurs can lose their sting with overuse and, today, both Bangals and Ghotis own up easily to their respective labels. “The rivalry was one between haves and have-nots and the sense of ethnic identification on both sides was immense,” says Novy Kapadia, football expert. Though both groups spoke Bengali, dialects differed, along with food habits, customs, moral codes, mannerisms and attitudes towards life. As recently as the late 1990s, Bengali actor Chiranjeet starred in a film called East Bengaler Chele (The Son of East Bengal), fashioned somewhat as a dated riposte to the 1976 romantic comedy Mohun Baganer Meye (The Mohun Bagan Girl). Rufus is a 2007 recruit to Mohun Bagan, a salaried professional with a diploma in sports management from Kolkata’s Indian Institute of Social Welfare and Business Management and a key actor in the professionalisation of the game in India. He is the suave new face of the club, which — like other Kolkata football clubs, including East Bengal — largely depends on the voluntary, loyalty-based work of its members. As operations manager, Rufus not only oversees regular club activities but also keeps an eye on the Mohun Bagan-SAIL Football Academy in Durgapur, another residential football academy in north Bengal (an English Premier League-funded corporate social responsibility project that trains underprivileged children in football) and the nursery and junior teams of the club. These are grooming grounds, he says, for future footballers. “The supply of local talent to Kolkata football has decreased largely because of lack of proper coaches and playing grounds. These projects have a long-term vision,” he says as we chat inside the Mohun Bagan club tent. Everything here is painted in the green-and-maroon club colours, from the walls to the seat and cushion covers. Inside the main hall, gossip knits together members, fans and players in huddles. On the walls are displayed a vast collection of framed photographs commemorating the visits of footballing legends like Pele and his club side Cosmos, Oliver Kahn, Lionel Messi and Diego Maradona, besides the club’s many onfield achievements. The pride of place on the ego-wall, naturally, goes to the single surviving photograph of the 1911 IFA Shield winning team led by Shibdas Bhaduri. The black-and-white photograph has since been hand-painted in green and maroon. The photograph shows the bare feet of the players surrounding the large IFA Shield on the ground. Barring one, all 11 members of the team played barefoot against the booted all-British side. “For much of our football history, right up to the 1980s, we were in a romantic mode. The current reality demands professionalism,” Rufus says. The November 20 Mohun Bagan-East Bengal clash is a test case for the new standards. As per a recent AIFF directive reportedly blessed by FIFA, clubs playing in the I-League have to organise their home matches independently. So, for the first time in history, Mohun Bagan will be hosting East Bengal without the support of the state-level Indian Football Association (IFA). For their first attempt at organising a derby, Mohun Bagan has roped in dozens of fan club members to man gates, accompany players, run errands and take charge of ticket sales. As they speak, their friend Sougoto Datta, a member of the Mohun Bagan fan club Mariners on the Move, joins in. They chat intelligently about football. But when it comes to club affiliations, there are no compromises. On winning a derby, East Bengal fans are known to send the hilsa to Mohun Bagan fan-friends, the hilsa being an emblem of the club, just as jumbo prawns are Mohun Bagan’s. In return, Datta professes a “natural aversion” towards red and yellow. “Even while shopping for weddings at home, I make sure there’s nothing in the East Bengal colours,” he says earnestly. In case you missed the point, consider this: For the November 20 match, Mohun Bagan printed all tickets in the host team’s green-and-maroon colours. In the run-up to the game, the ticket design becomes a sticking point. On the sidelines of an early morning practice session, a Mohun Bagan official angrily dismisses the reported threats of East Bengal fans to burn the green-and-maroon tickets. “They can go to hell,” he thunders as Mohun Bagan technical director Subrata Bhattacharya leads the team back after a long session in the sun while a couple of hundred fans, some in team colours, cheer them on. Inside the club premises, supporters accost Odafe Okolie, Mohun Bagan’s burly Nigerian striker. “Odafa, Odafa” they sing in chorus, some aggressively demanding that he “pump in at least three goals” on Sunday, big-match day. With an annual pay packet of Rs. 2 crore, Odafa is reportedly the highest-paid footballer in India. Both Mohun Bagan and East Bengal — officially, McDowell Mohun Bagan and Kingfisher East Bengal ever since they were adopted by United Breweries — are said to have salary budgets of Rs. 12-14 crore. But then, money has never been a major issue for these clubs. Indeed, there are only six-odd Bengali players in the 30-member East Bengal side. Mohun Bagan fares somewhat better: The 35-member squad has about 15 Bengalis. According to the IFA, there are 284 football clubs — men’s women’s and children’s — in the state. In the 2010-11 season, around 4,300 players signed up to play in the Premier, First, Second, Third, Fourth and Fifth division football leagues that the IFA oversees. “Ninety per cent of them are from Bengal,” claims an official. Finally, it’s here. Match day. Mohun Bagan versus East Bengal. Two hours before the 6.30 p.m. kick-off, the Eastern Metropolitan Bypass, an arterial road leading to the Krirangan, is clogged by thousands of flag-waving, body-painted supporters. Rival fans generously trade shrill abuses, enough, as a Maidan saying goes, to keep mothers and sisters chained to maternity wards for years. That neither Mohun Bagan nor East Bengal have won the prestigious I-League title since 2003-04 is irrelevant. Dempo of Goa has won the league four times between 2003-04 and now. At kick-off, a flawless wall of sound emerges from the bowels of the stadium. Around 90,000 fans have converged for a club-level football game, against the few thousand who watched West Indies play India at the recent Eden Gardens cricket test match. The football is scrappy. There’s a mid-match power-cut. Forbidden crackers pose real danger. But this is a vehemently masculine, perfectly bipolar world where everything else is extraneous. Against the run of play, Mohun Bagan scores off a penalty. Goooooooaaaal, goes one half of the stadium. The other half remains silent, then explodes with abuses. At the final whistle, the score reads: Mohun Bagan: 1, East Bengal: Nil. A somewhat undeserved win, feel many, but a win anyway, against East Bengal, too. While leaving the stadium, a stampede ensues, critically injuring two. Just another football game in Kolkata. Goa has risen steadily in India’s football hierarchy in recent years. In the last eight editions of the National Football League/I-League, Goan clubs have won six times. Clubs like Dempo, Salgaocar, Churchill Brothers and Vasco carry the Goan flag forward, their ‘cohesive football’ said to be the result of carefully nurtured teams. The game enjoys deep penetration in Goa, where inter-village football rivalries are common. With an assured supply of local players and corporate backers, the only way for Goan clubs is up. 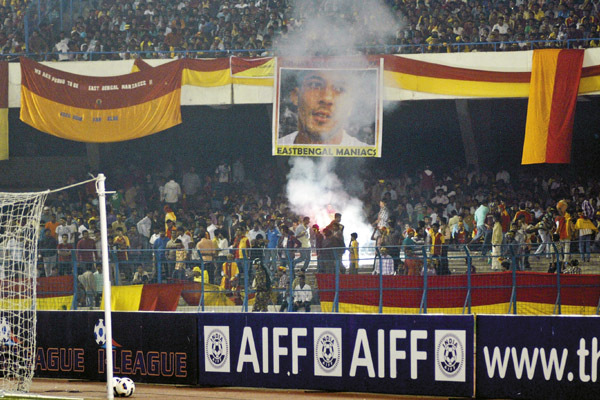 Till the 1980s, Kerala gave Bengal a run for its money on the football field. Some commentators connected the popularity of communism and football in the two states with the proletariat roots of both the ideology and the game. FC Kochin, SBT, Premier Tyres, Viva Kerala, Kerala Police and Malabar United stood atop the state’s football culture. Kerala has won the Santosh Trophy five times. Since the early 1990s, though, its fortunes declined steadily. The state’s hopes now rest with Chirag Kerala, its sole representative in the current I-League. Even if you take out Bhaichung Bhutia and Sikkim, the seven other states of the Northeast are a force to reckon with. Shillong’s Lajong FC, a regular in the senior I-League and Federation Cup runners-up in 2009-10, are the regional flag-bearers. Royal Wahingdoh and Ar-Hima of Meghalaya have also featured in the second division I-League competition. Though Nagaland does not have a club at the national stage, the state has hosted the Royal Gold Cup tournament for two decades. Manipur, however, is the one to watch: Though internal strife hampered professional football, the state, along with Mizoram, has supplied players to most major Indian clubs. In 2003-04, Manipur lifted the Santosh Trophy. The current senior Indian football team has six players from Manipur and Mizoram.